Native habitat Native to Japan, China, and Korea. It was introduced because of rapid establishment and heavy fruit production at an early age. Growth habit and rate Symmetrical canopy with a smooth outline; round to pyramidal with moderate crown density. In ideal situations, height and spread can be up to 60 feet. 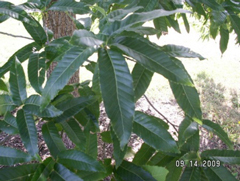 Foliage Has alternate, glossy oblong, no-lobed leaves with many fine serrations that terminate in a bristle-tip. 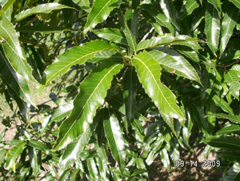 Leaf blade length is 4 to 8 inches, 2 to 4 inches wide. Autumn color is late yellow turning brown as the season concludes. Flowers and fruit Male catkins are golden in color, appearing in the spring; female catkins are spikes, appearing with the leaves. 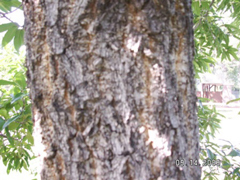 Bark Very ridged and furrowed, even so on young trees; gray-brown in color. Twigs Quite slender, red to gray-brown in color with multiple terminal buds; buds are gray-brown, pubescent on the bud scale edges and somewhat pyramidal. Insects and diseases Usually not affected by pests. Some chlorosis in high pH soils. Occasionally invasive in the Southeastern states. 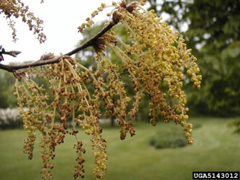 Landscape value Drought tolerance is high for Sawtooth oak. 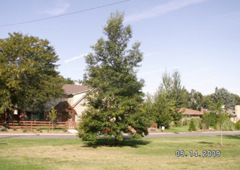 Very suitable for urban planting; shade tree, street or parking lot tree, yet widely untested. 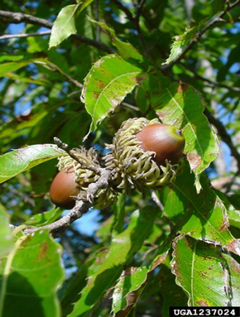 Acorns are quire popular with wildlife. Some known locations in Denver, Colorado are in City and Cook parks, and Monaco Blvd. Parkway (between 20th and 26th Avenue).